The first time that a SpreadsheetWEB application is invoked in a user session, the underlying workbook is loaded into memory on the server . This will affect the response time of the first calculation in proportion to the complexity of the workbook. Larger and more complex workbooks typically require more time to load into memory. SpreadsheetWEB includes some built-in features to pre-load workbooks across a series of nodes and retain these in memory to avoid this initially-slower response time during memory load, but these features are only available on the dedicated server and private cloud licensing models. In version 6.0, we have included significant improvements to our core engine to facilitate significantly faster initial workbook loading times. These types of improvements are also continuing throughout our current development cycle, so you can expect continued performance benefits through the next version release (6.1). In this blog post, we will focus on the performance improvements from version 5.2 to 6.0. We’ll also include a sneak peek at the improvements in store for the transition to 6.1. 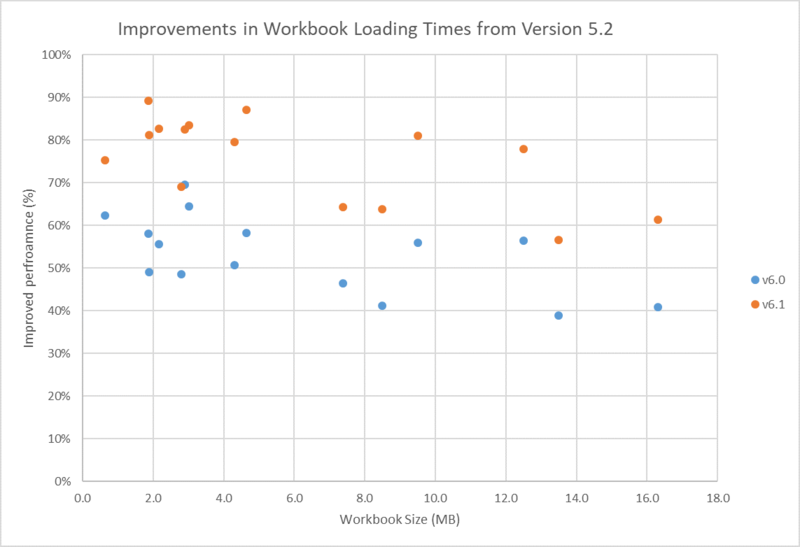 We tested 15 workbooks with complex formulas of varying sizes (ranging from 0.6 and 16.3 MB), measuring the initial in-memory loading times with versions 5.2, 6.0, and 6.1. These tests were performed on a laptop with a 2.7GHz, 2 core i7-7500U CPU. The table below lists the loading times (in seconds) with the corresponding workbook sizes. Below, you will find the performance improvement in percentage across the various versions. On average, the data indicates that version 6.0 loads workbooks approximately 50% faster than version 5.2. For example, one spreadsheet model at 4.3 MB required 20.1 seconds in version 5.2, which improved to only 9.9 seconds in version 6.0. These loading times are even faster with our upcoming release of version 6.1, where performance gains average about 70-80% improvement over 5.2, with that same file only requiring 4.1 seconds to load into memory. 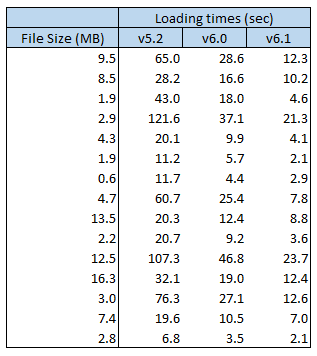 As indicated by the chart, the performance gains are larger for smaller files. On average, the performance improvements in 6.1 vary from the 80% to 60% range as we move from smaller to larger files. The gains are approximately 60% to 40% over the same range in version 6.0.